The simplicity of this burger, with the sweet sticky maple mustard glaze is definitely going to become a new favorite here! Dress these up with any additional toppings you would like. I highly recommend white cheddar (who doesn't love gooey, melty cheese), and bacon....because it's bacon. Additional dijon mustard doesn't hurt, either. -Whisk together all glaze ingredients and set aside. -Gently but thoroughly combine the turkey with the above mixture. Shape into patties with wet hands, as ground poultry can be sticky (I like larger burgers and this easily makes 4 large burgers) It can be stretched to 5 or 6 thinner burgers. -Grill on a lightly oiled, preheated grill until done. Ground turkey cooks surprisingly quickly. I cook mine for about 5 minutes per side, and start brushing with the maple glaze in the last couple minutes of cooking, flipping once to re-coat. Ground turkey should be cooked to 165F per Health Canada guidelines. Totally pinned this- looks and sounds amazing! That glaze sounds so flavorful and delicious! I love a good glaze. It's such an easy way to add different flavors to everything! Love maple & mustard together! These sound like an amazing turkey burger! 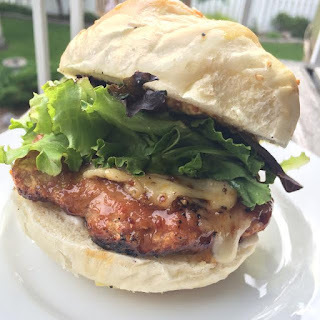 A way different take on most turkey burgers. 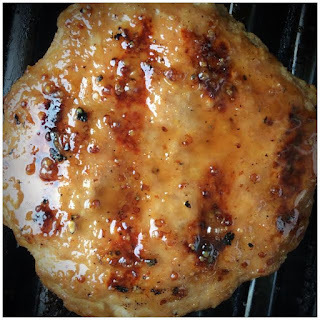 I am going to have to try these next time we do turkey burgers! Thanks! Usually I'm all about beef, but these are such nice change for us. Turkey burgers are always a welcome change of pace. That glaze! I never would have thought to glaze a burger! It sounds amazing! I have been looking forever for a delicious turkey burger recipe. This sounds amazing! Pinned! I'm in love with your maple glaze! These burgers have to be amazing and I'll be making them soon to find out.